The market for autonomous mobile robots (AMRs) continues to thrive, with multinational manufacturers across the supply chain integrating these flexible and collaborative robots into their general warehouse automation strategies. Autonomous mobile robots are a simple, efficient and cost-effective way to automate material handling and in-house transportation tasks in nearly any situation where employees would previously have been required to push carts around the facility. While companies such as Honeywell, Argon Medical, Flex, and Magna-Power are reporting great successes in both test and production environments, questions still remain about how robots are being used and whether their human counterparts are safe working alongside them. Are autonomous mobile robots safe? How are companies integrating AMRs in general automation? As mentioned previously, companies across the supply chain are integrating mobile robots in applications that require the transportation of any materials. They can be part of a fully automated fleet of robots that transport items around a warehouse or between a production facility and a warehouse. For example, at the Flex facility in Austria, two AMRs move materials along a 600-meter stretch from the warehouse to the product area without interruption, freeing employees from monotonous transportation tasks, and at New Jersey-based Magna-Power, two AMRs have freed the equivalent of three full-time employees from the repetitive, low-value transportation of components and assemblies so workers can focus their skills on higher-value activities. So how are they doing it? AMRs are extremely easy to program, and can be integrated in all types of indoor environments, including the most difficult dynamic plant floors. The MiR AMRs are even able to open doors and go up and down elevators. We also recommend companies start with one or two mobile robots, even if they have enough tasks to occupy an entire fleet. 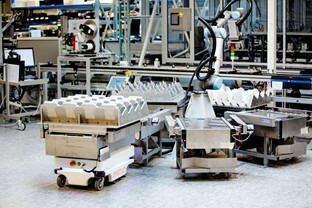 Get to know how they work and then it will be much easier and faster to integrate more robots across more applications. Also, start with a local trained distributor that can guide them through the entire process. How do they navigate through warehouses? Unlike automated guided vehicles (AGVs), which need to be guided by wires, magnetic strips, or sensors installed within the warehouse, AMRs navigate via maps constructed by software either on-site via its laser scanners or via pre-loaded facility drawings. It's much like a car with a GPS and a pre-loaded set of maps. Addresses are points on the map. When navigating between points, the system determines the best route. The AMR is taught locations to pick up and drop off parts via its intuitive interface, where it is also possible to define areas where it should accelerate or de-accelerate, preferred areas to drive in, and areas where it is not allowed to drive. The AMR uses data from cameras and built-in sensors and laser scanners as well as sophisticated software that enables it to detect its surroundings and choose the most efficient route to the target. It works completely autonomously, and if forklifts, pallets, people, or other obstacles occur in front of it, the AMR will safely maneuver around them, using the best alternative route. What's the typical return on investment? The easy integration and the fact that companies do not need to make changes in the existing factory layout when integrating AMRs allow low initial costs. Moreover, AMRs are a reliable workforce that can run for around 12 to15 hours without breakes. They can charge automatically, when they do not have tasks to perform, ensuring a smooth workflow and optimizes the internal logistics. The ROI is typically less than a year, due to this easy integration and because one robot usually – depending on the application - frees up two full-time employees to perform higher value tasks.